Indiana Governor: Lawmakers To 'Clarify' Anti-Gay Law : The Two-Way Mike Pence, who signed the controversial Religious Freedom Restoration Act last week, says he didn't anticipate the level of hostility the law has engendered. Some of the hundreds of people who gathered outside the Indiana Statehouse on Saturday, for a rally against legislation signed Thursday by Gov. Mike Pence. Indiana Gov. Mike Pence — facing a major backlash from a new law that would allow businesses in the state to cite religious objections to refuse to serve gay people — says he supports an effort to "clarify the intent" of the legislation while acknowledging surprise over the hostility it has sparked. As we reported on Saturday, the Religious Freedom Restoration Act — approved by the Republican-dominated Indiana legislature and signed by Pence on Thursday — immediately touched off a vociferous online campaign against the law, as well as a protest on Saturday in front of the Statehouse. Indiana's RFRA, which goes into effect in July, has also caused some high-profile businesses, such as Angie's List, to rethink expansion plans in the Hoosier state, potentially costing the economy tens of millions of dollars in and thousands of jobs. Although the law is similar to a federal one and those in 19 other states, sexual orientation is not a protected class in Indiana, leaving the door open for discrimination, critics say. In an interview on Saturday with The Indianapolis Star, Pence, a Republican who served in Congress for a decade before becoming governor, said: "I just can't account for the hostility that's been directed at our state. "I've been taken aback by the mischaracterizations from outside the state of Indiana about what is in this bill," he said, reiterating his support for the legislation. However, he said the governor's office was in discussions with lawmakers this weekend "to see if there's a way to clarify the intent of the law." He said those changes would likely be introduced sometime this week. Asked by the Star if he might make gay and lesbians a "protected legal class" in the state, Pence replied: "That's not on my agenda." Appearing on ABC's This Week with George Stephanopoulos, Pence talked of an "avalanche of intolerance that has been poured on our state" but declined to answer the question of whether the law makes it legal to discriminate. 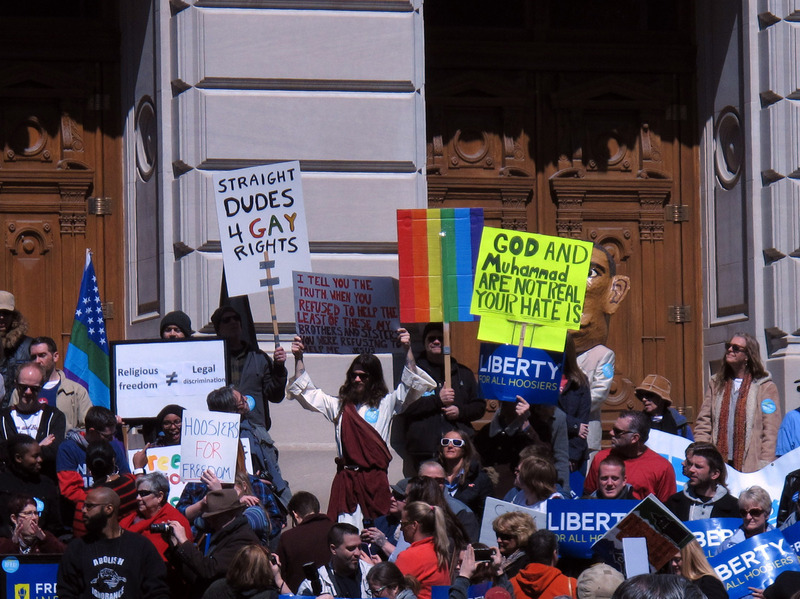 On Saturday, hundreds of people gathered to protest at the Indiana Statehouse. Although police didn't provide an exact figure for the number of people who turned out, member station WFYI reported it was about 3,000. Many chanted "Pence must go!" and others held signs that read "No hate in our state."